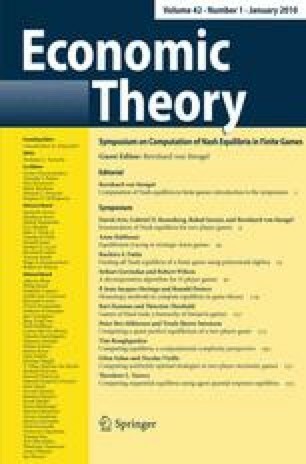 This paper describes algorithms for finding all Nash equilibria of a two-player game in strategic form. We present two algorithms that extend earlier work. Our presentation is self-contained, and explains the two methods in a unified framework using faces of best-response polyhedra. The first method lrsnash is based on the known vertex enumeration program lrs, for “lexicographic reverse search”. It enumerates the vertices of only one best-response polytope, and the vertices of the complementary faces that correspond to these vertices (if they are not empty) in the other polytope. The second method is a modification of the known EEE algorithm, for “enumeration of extreme equilibria”. We also describe a second, as yet not implemented, variant that is space efficient. We discuss details of implementations of lrsnash and EEE, and report on computational experiments that compare the two algorithms, which show that both have their strengths and weaknesses. Rahul Savani: supported in part by EPSRC project EP/D067170/1. We would like to thank Charles Audet for providing helpful detailed comments on an earlier draft of the paper.